Our new Caspian High Cap Smooth Grips are manufactured with the same precision as all of our products. These smooth grips are similiar to our EMP smooth grips in that they are designed with a slight ribbing to the finish. This finish gives a slightly better purchase than the completely smooth surface grips. Our Smooth Caspian High Capacity grips are designed to fit the Caspian 38 Super High Capacity, the H.C. 40 pistol from Les Baer Custom and the Caspian Hi Cap 40 Cal. 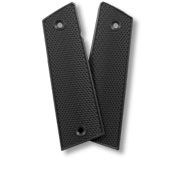 Our new Caspian High Capacity Checkered Grips are manufactured with the same precision as all of our products. These checkered grips are designed for maximum purchase by using our complete coverage checkering pattern. The contour of the grip allows us to offer a very aggressive checkering depth without loosing any structural integrity in the grip. This aggressive finish gives gives the best purchase available of any Cacpian High grips on the market today. Our checkered Caspian High Capacity grips are designed to fit the Caspian 38 Super High Capacity, the H.C. 40 pistol from Les Baer Custom and the Caspian Hi Cap 40 Cal.